I discovered W & P's carry on cocktail kit when browsing on Instagram. I purchased one of my favorites, the Moscow Mule. And I must say, that it's a pretty cool concept. It's not the cheapest solution for a drink, but it's definitely one of the coolest. (A "oneway" kit costs 24$. A "return" kit costs 40$) It suddenly became sophisticated to carry your booze in your pocket. The Champagne Cocktail, The Moscow Mule, The Gin & Tonic, The Old Fashioned & The Bloody Mary. So there's a taste for everyone. 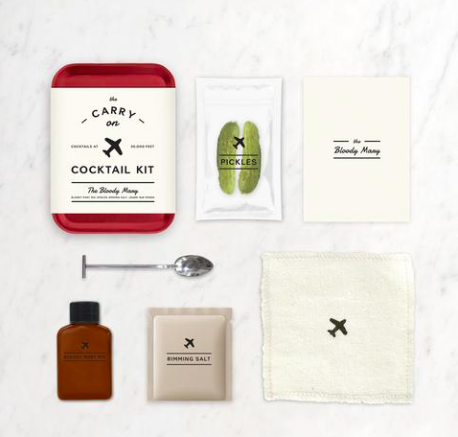 The Carry On cocktail kit is made by Eric Prum and Josh Williams, the 2 founders of W & P Design. They are based in Brooklyn (NY), and if you're in the area both Eric and Josh can be found in their workshop, creating, designing and tasting, which of course includes a cocktail. The Carry on cocktail kit is not the only product in W & P's portfolio. They also do a lot of other cool products.